Fasten your seat belts; we're going from goggles to giggles with Baby Aspen's Baby Pilot layette set! 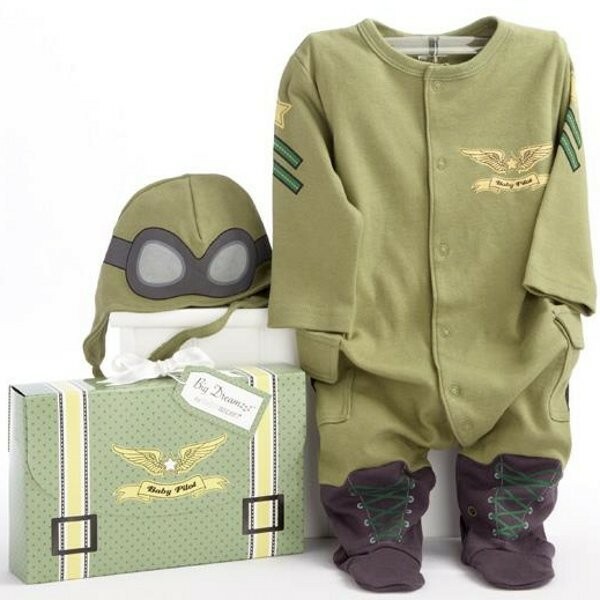 This adorable, olive-green pilot-style bodysuit with black and gold accents and coordinating cap are 100% cotton. The body suit has stars and stripes on the sleeves, wings with a "Baby Pilot" banner on top, real pockets on the legs, and black boots with green laces, and the comfy olive cap features pilot's goggles. This set comes packed in a gift box, perfect for a shower present! Comes in size 0-6 month.